*****************Maz's Carer Blog***************: Carer's lot and plants to pot! Carer's lot and plants to pot! Hi guys, things have been pretty settled this week! Coo's still on half doses of keppra one of his AED's (anti epilpesy drugs) and seems to be coping ok with the changes - thankfully. It's always a worry as things can fairly quickly, spiral out of control. We've been lucky this time, apart from some erratic sleep patterns I can honestly say, Coo's doing ok at around 10 seizures a day! I'm pretty sure there's still plenty of time yet for planting and with a sometimes, troublesome shoulder (due to years of caring), it's probably just as well the rain's called a halt! I'm really in no hurry and just enjoying the pottering about bit! Although, I did manage to pick-up two wee fruit bushes cheap! 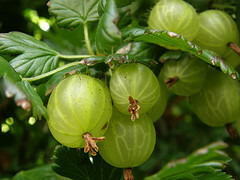 A gooseberry and a black currant one from the local £-shop! Maybe even make some lovely jam! You know, I always thought gardening was all hard work. I felt I'd be too tired after being up all night coping with Coo's seizures but you know what? It's not...it's really quite good for you and I can honestly say it's giving me a lot of unexpected pleasure! A rather wet and muddy, welly wearing maz! Well Maz, we've had a lovely dry sunny and warm day here. In fact I took a pot of tea outside and sat (admittedly in my coat) with my face raised like a daisy to the sun. Hope the sun shines on you too . .
Carers look after plants too!